This week we have a belated nod to 4/20 with a peek at Mary Jane&apos;s history on the Hill. Along the way, we found a few other tidbits — like a non-human lobbyist and other Hill creatures. Previous #tbts can be found here . Want more? Follow along ! Q: What 1987 NPR news story caused members of Congress to admit to their own use of marijuana? 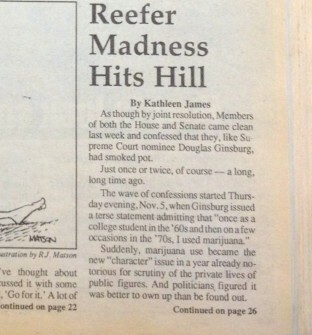 Published in November 1987, several members admitted to recreational use of marijuana. 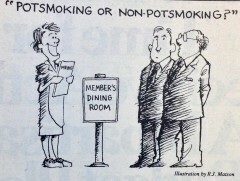 A cartoon featured in the Nov. 22, 1987 edition of Roll Call. A: In 1987, Nina Totenberg of NPR revealed that Douglas Ginsburg, Ronald Reagan&apos;s pick for a spot on the Supreme Court, had smoked marijuana when he was teaching at Harvard. Ginsburg subsequently withdrew his name from consideration. 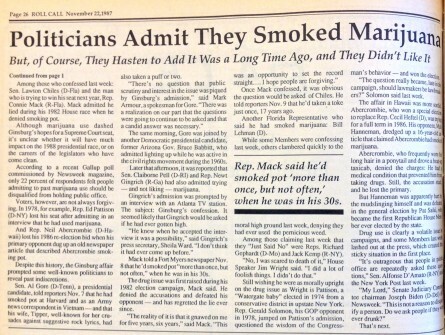 In the aftermath, several members of Congress came forward about their reefer-using habits, such as Sen. Lawton Chiles, D- Fla., and then-Rep. Connie Mack III, R-Fla. They joined the ranks of others, such as Sen. Al Gore, D-Tenn., who had admitted to marijuana use only a few weeks prior. Totenberg won the Alfred I. duPont-Columbia University Silver Baton in 1988 for her work. Roll Call founder Sid Yudain wrote in his King of the Hill column, "One might say Ginsburg was the victim of a weeding out process," adding, "Ginsburg&apos;s admission saved the Senate from calling a joint session." 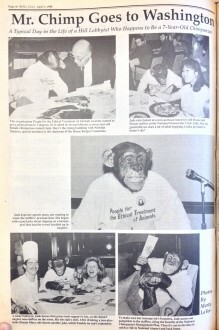 Q: Which unusual lobbyist visited the Hill on behalf of People for the Ethical Treatment of Animals in April 1988? A: Jade, a 7-year-old chimpanzee. Jade the chimpanzee visits with members and staffers on the Hill. Q: What feared creature was set to become the most powerful force in Congress in 1988? A: Cal-Cong, or the California representative. The horrifying menace could be easily identified by the Walkman tuned to NPR, Sonny Bono mustache and soft-sole sandals, among other things. Given the state&apos;s influence in the CQ Roll Call Clout Index , readers are free to make their own judgments as to whether the fears were prescient. 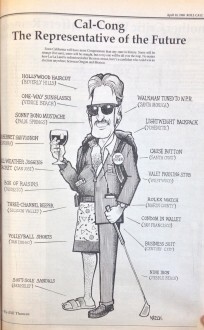 The identifying features of a typical representative from "La-La Land," according to the April 10, 1988 issue of Roll Call.